Create artisan flavoured water at your next gathering. 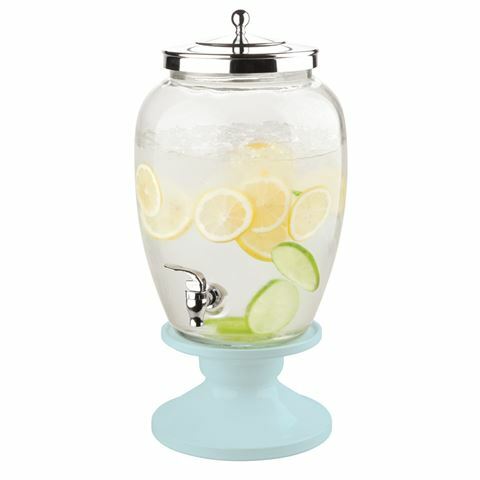 Simple add your favourite chopped fruit, still or sparkling water and you add a beautiful touch to your bar or buffet. It’s presented on its own pedestal and includes a BPA-free, durable spigot that allows guests to serve their own beverages throughout the day. It’s easy to top up too, thanks to its large opening at the top, while its soda glass construction means that you can show off your favourite punches, cocktails and more in style. Live your best life with Avanti. Made from hand blown soda glass with a ceramic stand. This stand allows drinks to be poured without dangling the spout over an edge. BPA-free chromed spigot for drip-free pouring. Finished with a metal lid that seals with a gasket. Large, removable lid for easy filling and cleaning.